Automated Warehouse Systems Parts, Maintenance & Service - Westfalia Technologies, Inc.
At Westfalia, we are committed to your success and are an active partner in every project stage: planning, design, manufacturing, installation, testing, training, commissioning and maintenance/service. Our business is about solving problems for customers and building successful relationships. As designers and planners – not simply technology providers – the most important driving force for us is working alongside our customers as an active partner. That partnership is what builds trust. Understanding each customer’s specific needs is the only way we can guarantee that the customer receives a total solution that matches their economic, technical and organizational requirements. We understand that no two clients are alike which is why our service team provides custom support solutions based on individual client needs. Westfalia works to maximize client satisfaction and product quality through all the phases of the warehouse project and throughout the lifecycle of all Westfalia systems. Westfaila's multi-million dollar test facility allows us to test improvements to products and software to better our solutions and to stay at the forefront of the technology. This facility also serves as a state-of-the-art training facility to provide customers with hands-on, improved training on using an automated storage and retrieval system (AS/RS). 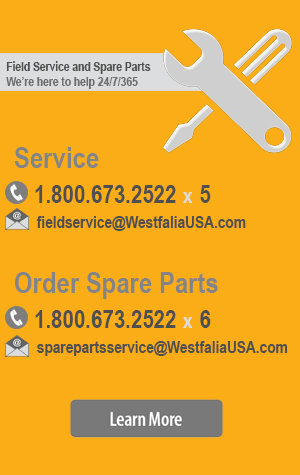 At Westfalia, customer satisfaction is our ultimate goal. Our customer solution team provides fast, friendly service available 24/7/365. We put just as much commitment into the maintenance and spare parts provision for a system that has been running for years or decades as we do on the first day of operation. .